There is something quite magical about reading one book with your family at the same time each year. I’m thinking of “The Night Before Christmas” by Clement C. Moore read each December when I was young by my mother or father. I have fuzzy memories of sitting on the sofa, leaning up against a parent, looking intently at the pictures and listening with comfort (and excitement!) to the story that I knew so well. I still have the worn copy my dad had when he was young, with the familiar illustrations. It was a peek into another world where men wore nightcaps to bed, mice slept soundly at night, and Santa’s sleigh really landed with a clatter on people’s roofs. We have so few traditions in our hustle-bustle world–so little of any common culture in society today–it is heartening to think that we can, as parents, hand down this small gesture, the tradition of reading the same story each year, to our children. With this tradition we hand down the feeling of being part of a family and being included in a common family culture; we all know this same story. A good book for creating a tradition is one that has a generous helping of wonder and that stays special because it is appropriate for just a certain occasion. Imagine reading the same adventure book each year on vacation or a keeping a birthday book to be read just around that day. This time of year, you may want to read about the holidays you observe or the change to new weather. Whether you are celebrating Christmas, Hanukkah, Kwanzaa, Muharram, Winter Solstice, or hot chocolate season, add a children’s storybook to your family’s traditions. Once you have chosen a book, you can make it even more memorable by presenting it to your family as a gift. Family Reading Partnership and nationally syndicated columnist Amy Dickinson of “Ask Amy” have teamed together for the fourth year promoting “A Book On Every Bed.” The idea is that after you choose a new book for your family or choose a book for each child, you wrap it up and place it at the foot of your child’s bed one evening. Then in the morning, there is a special gift to unwrap and read together! You can do this with a new book or a book you have read year after year. You can use a seasonal book or a book you know your child will enjoy based on his or her interests. Get adults in the family involved too and put a specially chosen book at the foot of every family member’s bed, young and old. 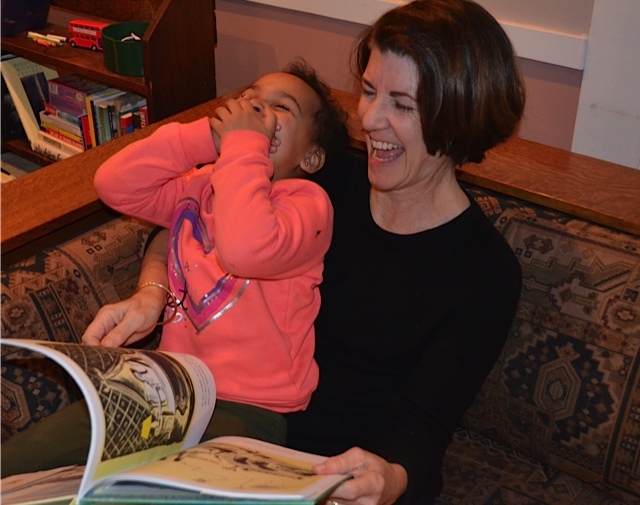 Have a warm and wonderful December filled with happy family reading!